At the start of this year, a popular journal featured a leading article on prominent living Indians who, in the 20th century, had inspired India's�younger generation.�I have no comments about those listed but was disappointed to note�the article did not include the name of�Field Marshal�Sam Hormusji Framji Jamshedji Manekshaw.�Was this an unfortunate lapse?�Did the editor consider the soldier unworthy of inclusion? Was this another example of the tendency in democracies to only remember their military leaders in times of danger and forget them in peacetime? I'm not sure of the answers to these questions. Today, Sam Manekshaw celebrated his 90th birthday. Senior Army officers celebrated the occasion in Delhi and many newspapers published summaries of the field marshal's distinguished career.�I have no desire to add to this paean of praise. However, one incident in Manekshaw's distinguished career bears repetition.�Readers may recall that, on March 25, 1971, when political events in East Pakistan had taken a turn for the worse, the Pakistan army cracked down on Bengali intellectuals and leaders, killing over 50,000 of them.�Millions of refugees began fleeing into India to escape from this organised genocide.�The exodus of refugees placed an unbearable financial burden on India and strained the fabric of social structure and political stability in eastern India. Later, Manekshaw attended a Cabinet meeting where the PM repeated she wanted the armed forces to invade East Pakistan as quickly as possible so that a pro-Mujibur Rehman government could be installed and millions of refugees returned to their homes. 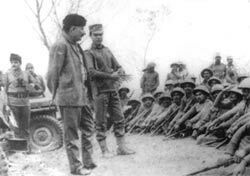 The general explained there were over 90,000 Pakistani troops in East Bengal and he needed to move two army corps into the area, one into Bengal and the other into northeast India.�These moves could not be completed in less than two months. The PM kept quiet but her ministers protested and said the economic and political situation in the states adjoining East Pakistan had become intolerable and he must act more quickly. 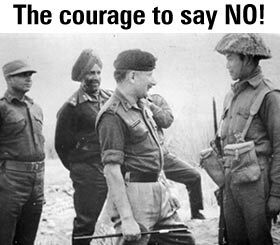 Manekshaw recommended the earliest India should launch military operations was in November.�This statement was met with an uproar of indignant protests.�The PM again kept quiet but her ministers said such a prolonged delay was unacceptable. Manekshaw told the Cabinet the monsoon in that region was very severe.�He quietly explained how the whole area of Bengal, East Pakistan and northeast India becomes a virtual lake. All road transport would cease.�If India launched operations in June, the results would be disastrous.�He would rather resign than act against his professional judgement.�The PM ordered the general to move his formations into position and be ready by June. Operations would then be launched depending on the circumstances.�The Cabinet meeting was called to a close. Manekshaw was well aware of all that was being said against him. He kept his cool. While he managed the movement of troops, essential supplies and armaments to the east and dealt with the politicians in Delhi, he gave the Eastern Command a free hand to plan the operations in detail.�Meanwhile, the armed forces built up the minimum required administrative and communication facilities around East Pakistan. The delay also enabled the arming and training of the Bengali guerrilla freedom fighters, the Mukti Bahini.�The delay witnessed the establishment of a formal Bangladesh government in exile inside India, enabled the government of India to finalise a Treaty of Friendship with the Soviet Union and neutralise interference from both China and the US. By late October, as the intensity of the rains decreased, the media once again clamoured for military action.�Armchair strategists had a field day publishing various tactical scenarios on how best to overcome Pakistan's defences. A late monsoon made cross-country movement difficult until the last week of November.�By this time, the performance of the Bengali freedom fighters had gained momentum. They dominated the countryside in East Pakistan and had confined the Pakistani army into several garrison towns, cut off from Dacca.�The morale of the Pakistan army in East Bengal was very low. On the other hand, thanks to thorough planning, our troops were properly located and well prepared.�Thus, when the Pakistani air force carried out a pre-emptive strike on the Indian airfields on December 3, 1971, from West Pakistan, Indian forces around East Bengal were itching to go into action and were able to end the campaign in a fortnight and capture over 90,000 prisoners of war. Two historical events of far-reaching consequence, though widely separated by time and space, have striking similarities.�General Manekshaw's refusal to be hustled into attacking East Pakistan during May and June 1971 bears a marked similarity to the refusal by Marshal Kutuzov, the commander-in-chief of Russian armies, to defend Moscow against Napoleon in 1812.�Both came under increasing pressure from their governments -- the czar in Kutuzov's case and Indira Gandhi in Sam's case.�One refused to defend and the other declined to attack.�By refusing to defend Moscow against Napoleon, Kutuzov saved the Russian armies and eventually saved Russia.�By declining to attack East Pakistan in May-June, Manekshaw preserved India's honour. Both resolutely held on to their professional assessments of the military situation and nothing could make them budge from that position. All are now agreed that had India attacked East Pakistan in June 1971 it would have been an unmitigated disaster for the Indian Army. Had it been a lesser army chief than Sam Manekshaw, the government would have stampeded him into on the offensive as it so easily did in the 1962 war against China, Operation Blue Star in Amritsar and the misadventure in Sri Lanka. Indian troops�won their last great victory against a foreign army of importance in 303 BC when�Chandragupta� Maurya's army defeated Seleucus Nicator.�After 2,300 years of unremitting defeats of Indian armies against every invading army, Sam Manekshaw made the country experience the glow of a stunning victory against the Pakistan army in what is now Bangladesh.�That will remain Field Marshal Manekshaw's unique position in Indian military history.